Extremely affordable tickets went up again yesterday for all of the seasons for 2016. Had such a wonderful meal at the spring and summer menu I couldn't help but grab tickets for all four. Really looking forward to the upcoming Goose/Grimm menu as well. Can't wait! Had another great meal at Elizabeth recently. Not quite as out of the box as other menus, but the Native American Tribute Series was yet another demonstration of how special this restaurant is. However, I would warn people to ask questions before committing to the beer pairing. My dining companion had it and got six pours of about 3-4 ounces each. The charge was $75. According to the printed menu, he was supposed to get 7 pours. But unless that missing pour included a six-pack to take home, we're talking about some pretty questionable pricing. 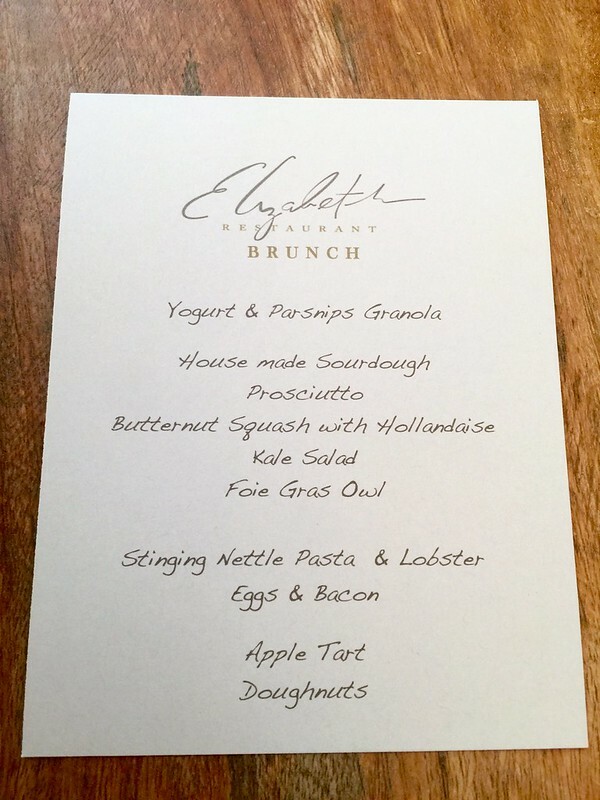 MarlaCollins'Husband wrote: Had another great meal at Elizabeth recently. Not quite as out of the box as other menus, but the Native American Tribute Series was yet another demonstration of how special this restaurant is. I don't think I posted after my last Elizabeth visit, but my table was also astonished when we realized how much we'd paid for the beer pairing vis a vis the value received. This was my third meal at Elizabeth and my boyfriend was so irate that he asked me if we could get rid of our upcoming reservation. I've always felt as if the meals at Elizabeth were a good value, but charging what is effectively a 7x markup over comparable restaurant prices left a very bitter (not hoppy!) taste in our mouths. I suspect our next meal will be our last. I've never done the beer but have done the wine pairings a few times. Pretty sure we were served 12 wines total with the Native American theme. White heavy but well paired for the most part with a nice twist at the end poured by chef Regen that I hope they continue with. marlacollins'husband and chgoeditor. will definitely make it a point to make it up to you. don't want you to leave unhappy or under poured. let me know personally, send email to info@elizabeth-restaurant, attn: chef and next time you are coming in, we will make sure you are taken care of. Was there a mistake - should the pours have been bigger or were some pairings missed? ilianaregan wrote: marlacollins'husband and chgoeditor. will definitely make it a point to make it up to you. don't want you to leave unhappy or under poured. let me know personally, send email to info@elizabeth-restaurant, attn: chef and next time you are coming in, we will make sure you are taken care of. I just responded privately to Chef Regan, and expressed my appreciation that she's open to customer feedback and wants to remedy things when diners have a bad experience. I also own a small business, and know firsthand that taking customer criticism isn't always easy. I applaud and thank her for striving to turn a negative experience into a positive one. I'm heading there soon for Mother Goose - can't wait. Are wine pairings splittable currently? Can those beers (wonderful picks) be ordered by the bottle, or only by the full pairing? Hi. wine pairings can be split and the beers can all be ordered by the bottle. Food & Wine's 2016 list of Best New Chefs is out, and, for the seventh year in a row, a Chicago chef is among the winners. Iliana Regan, chef and owner of Elizabeth (4835 N. Western Ave.) and Bunny the Micro Bakery (2928 N. Broadway), joins an impressive list of past and present award winners. "I've known about the award for years," Regan said, "but there wasn't any expectation out there, other than hopes and dreams. I was working at Alinea when chef Grant (Achatz) got it (in 2002), and I remember it being a big deal. It's a really nice feeling, because we work so hard and for so many hour. Once in awhile, when we're extremely exhausted and tired and wondering what's going on, it's nice to have this recognition that you're doing something right." I received an email today about some upcoming Downton Abbey meals that remined me that I'd never posted about an outstanding and really enjoyable Game Of Thrones dinner we had back in June. Not only was it delicious -- with a ton of seriously memorable high points -- but the overall experience was truly a special one. No one should be surprised that even with Chef Regan away at the F&W event Darren alludes to above, the team performed magnificently in her absence. The GoT touches to the decor were really fun. And I loved how the food/menu paid homage to a sincere appreciation and love of the show/books without being overly literal or cheezy. That's a fine line and I think they nailed it perfectly. Lastly, and certainly not least, I really enjoyed the themed cocktails and the few pairings I tried. There were several less familiar wines in the pairings that I was grateful to have tried. Elizabeth remains one of the finest and most unique places to dine in Chicagoland. I think she's a genius, and the fact that I have not loved every single dish I've had of hers is likely because she is constantly making new and wildly original things and not because there was anything necessarily wrong with the food. (That is, it was me, not her.) Even better, neither she nor her food have the same air of entitlement that pervades a lot of fine dining. 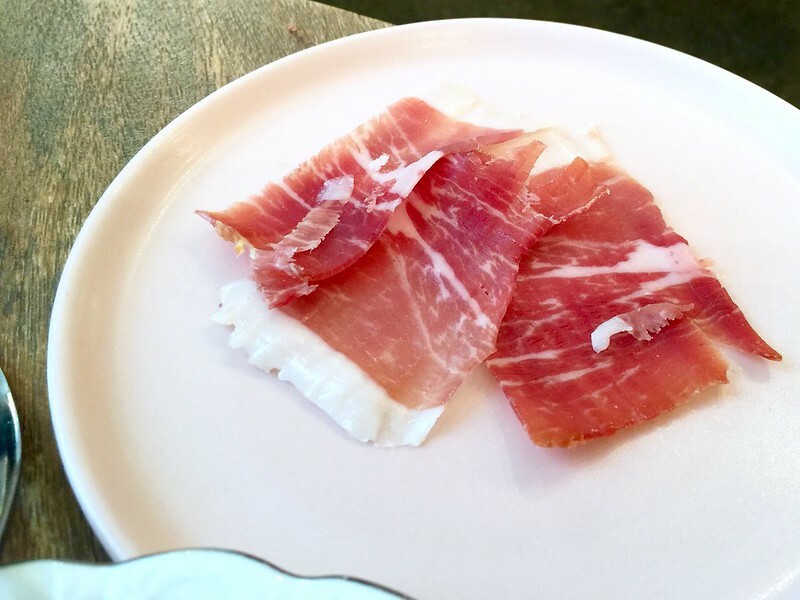 She does not act like she is doing you a favor by letting you eat at her restaurant, and she exudes a sense of fun, curiosity and creativity that generally avoids annoying whimsy and pretension. It can be a fine line, and she has almost always fallen on the right side of it. Started with a "Bitter End" cocktail which was described as Manhattan-like, but had little of the bourbon burn (although it had plenty of kick), and awesome scent of orange peel (lots of orange bitters, along with port and some Italian bitter aperitif). The amuses were complex, tiny bites: the first one a buckwheat cracker with mushroom and grated cheese and lots of other things that overall reminded me of chopped liver. The second one was a corn chip shaped like a mussel shell with corn and again more things than I can remember, presented on a very pretty array of actual mussel shells. I know I'm going to leave out some courses -- the menu ended up in Sue's purse which, along with her, isn't in the house right now. A Wisconsin parmesan cream sauce with black truffles, tiny diced zucchini 'hearts', and ribbons of zucchini came off as one of the best renditions of Alfredo. Have to remember to add a little (real) truffle next time I do an Alfredo sauce. The bread course came with several other dishes on the table. This was by far the most substantial course with two big slabs of bread each, house-cultured butter with tomato salt. There was a local chanterelle in a butter/beer vinegar sauce (wow, there's a great thing to soak up with bread); a watermelon gazpacho gel with cucumber, buttermilk pudding drops, flowers and something tasty pickled (probably the weakest dish of the night); blistered shishitos and baby okra, and a couple others I'm forgetting. Raspberries and cherry tomatoes with miso was interesting. The two sour fruits worked better together than separately. Pickled, dried, then braised thin slices of squash were outstanding. A dish of cubes of fingerling potato (and something else I'm forgetting), some house-made sour cream, flowers, etc. - not that strong a dish in terms of surprises and variety but very tasty. The 'main' was maitake mushrooms breaded with cattail pollen and rye flour over a garlic aioli. The best of the savory courses. The transitional dish, though, was my favorite of the evening: Smoked buttermilk sorbet with pine oil and corn curd. Wow. Barely sweet at all (the corn curd was sweeter, but no sweeter than sweet corn), smoky, sour, rich and yet fresh and cleansing. I wanted to take home a pint of this (no, a gallon). I don't even remember what the dessert was, the buttermilk sorbet is still so strong in my mind. The mignardise was a dark chocolate owl with buckwheat crisps. Great chocolate with a raisiny note. We were there on Friday night, and my recollection of the meal is almost identical to Joel's, even down to starting with the same cocktail and sharing a similar opinion. The only extra detail I can think of right now, is that I'm fairly sure the watermelon gazpacho gel dish included some extremely thinly sliced radish, which may have been the "something tasty pickled." The cook who brought that course out told us the watermelon portion was meant as something of a palate cleanser between other portions of the course, and I think it worked well in that regard. The protein additions I believe included beef tartare, smoked salmon and salmon roe along with the foie, but we both opted to stay with the vegetarian menu. Oh, the final dessert involved a marigold and parsley sorbet, tapioca and apples. 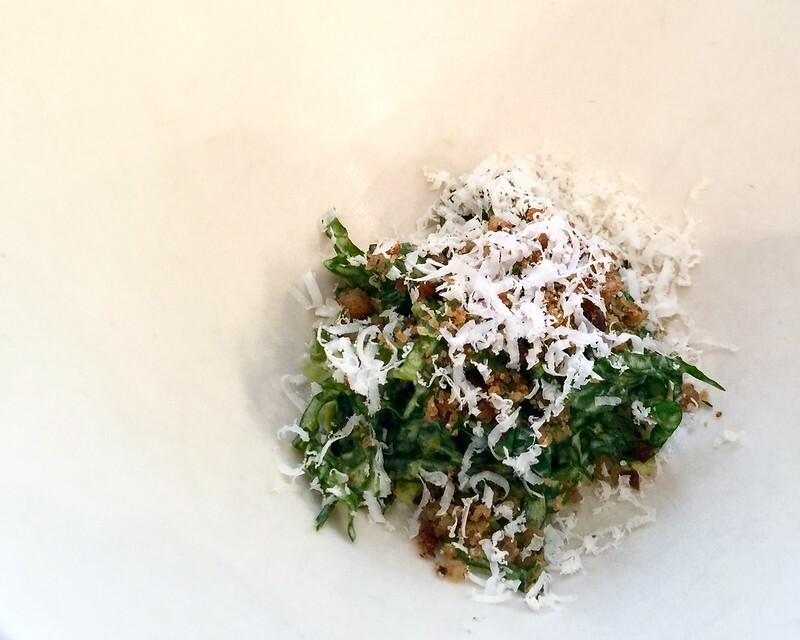 I liked the parsley sorbet, but I'll agree that the smoked buttermilk sorbet stole the show when it came to sweet dishes. It was a superb dinner, as always. Wine pairings continue to be among the most unique I've encountered, which manages to justify the price for me, and my wife adores the non-alcoholic pairings. Ah, that's right: tartare, not tenderloin, and I'd forgotten about the salmon. I was a little more negative about the parsley sorbet: I found it pretty bitter and grassy on its own, but it complemented the apple components nicely, balancing out what would have been one-note. On the watermelon dish, there was definitely a cross-sliced, green pickled item that looked like more cucumber at first, but was sharply pickled and crunchy. The radishes I think were raw. Before brunch at Elizabeth last weekend, I had dined at Elizabeth twice for dinner - one fantastic meal documented upthread, and a rather lackluster Game of Thrones dinner (many execution errors) I had with another LTH friend. There was a significant kitchen change shortly after our GoT dinner and perhaps my GoT experience is due to this unfortunate timing. 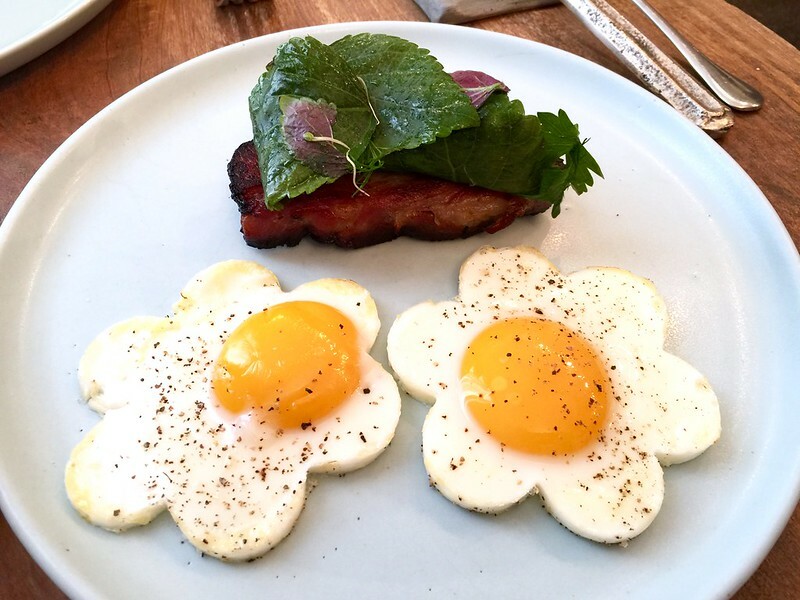 In any event, this brunch was so fantastic that I really need to give dinner another try. 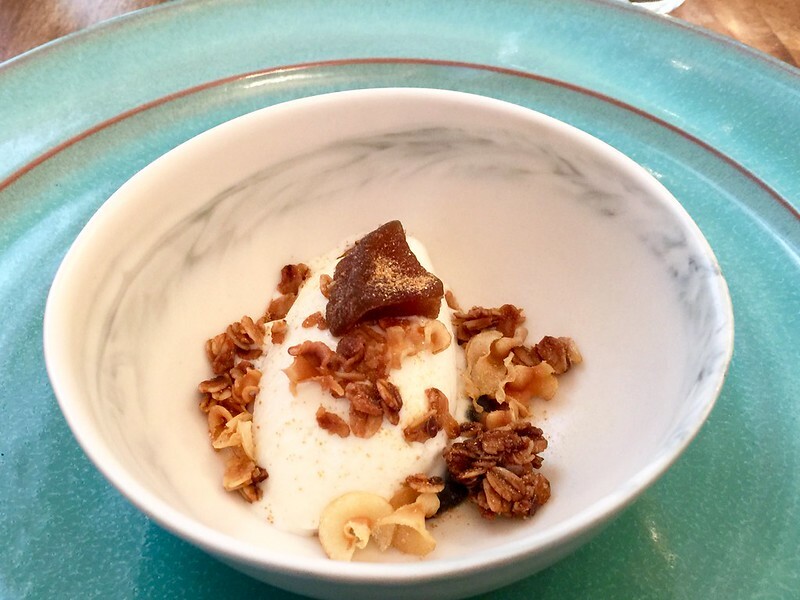 Brunch began with yogurt and parsnip granola, which also featured a black olive puree. This was a terrific combination and the black olive paired beautifully with the sweetness of the dish. I love flavor combinations that I would never anticipate and this was as perfect an example of that. 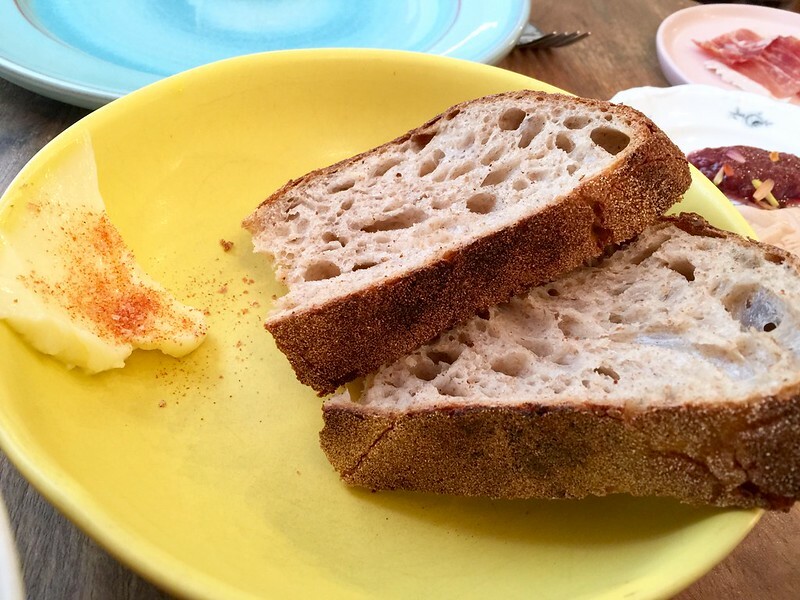 If you know me, you've probably heard me go on and on about the incredible bread at Cellar Door Provisions. I'm now going to talk plenty about the sourdough bread at Elizabeth - the crust, the crumb, the flavor. This is what you dream about when you seek out sourdough. It hardly needed accompaniments but there were plenty - butter, a foie gras owl and raspberry jam, and prosciutto. As good as the bread was on its own, it was that much better when eaten with the foie gras & raspberry jam. Served at the same time as the bread were butternut squash with hollandaise and a kale salad. Both were excellent, but the kale salad surprised me most simply because I usually dislike all things kale. The kale was cooked until tender but not mushy. There was some Wisconsin parmesan-style cheese and toasted breadcrumbs. There seemed to be something slightly smoky to the dish though I'm not sure what it was. But this is kale I could not stop eating (never thought I'd say that). The butternut squash was not only a pretty dish, but also delicious - the squash and hollandaise made for a perfect pairing. The two main entrees were eggs with bacon and stinging nettle pasta with butter poached lobster. The bacon was the stuff dreams are made of. I'll be honest - I'm pretty much baconed out from chefs making every damn food with bacon. But give me an incredible hunk of bacon as it was meant to be and I'll shut up, curl up in the corner of the room, and gnaw away. That was this bacon. I think those are shiso leaves (?) on top of the bacon - another interesting touch. And the eggs were a perfect sunny side up too. The pasta with lobster was every bit as good, probably better. The pasta was terrific and perfectly al dente. The lobster also poached beautifully. Add in radishes, more parmesan-style cheese (something I wouldn't have expected to work with the butter-poached lobster) and you have a perfect dish. 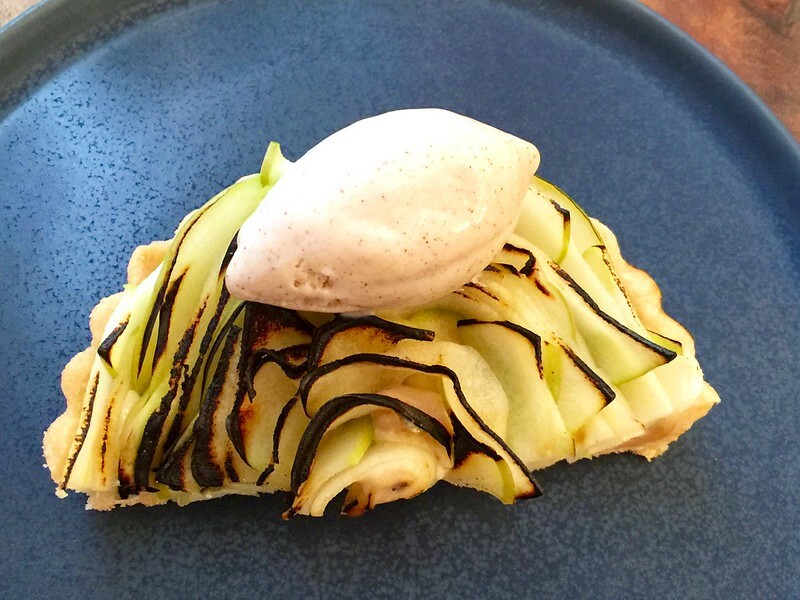 Brunch ended with an apple tart served with cinnamon ice cream and a brioche doughnut with a whiskey glaze. 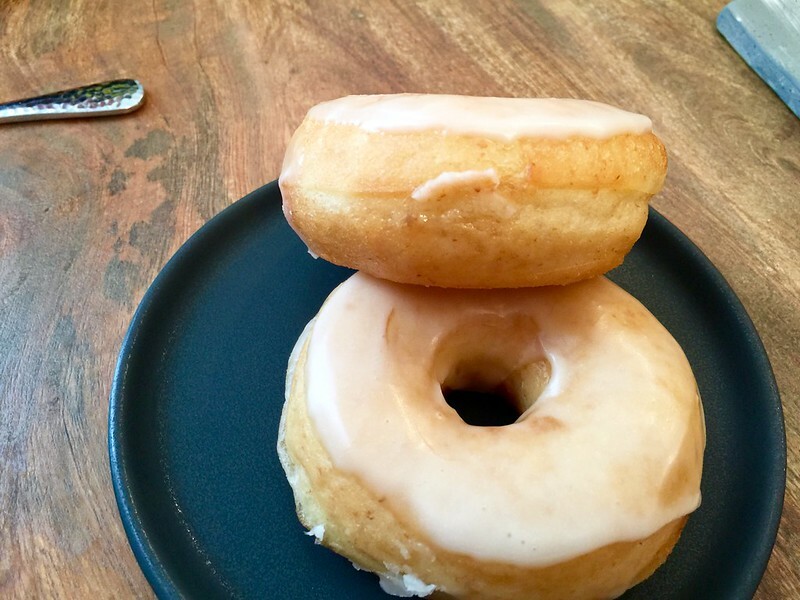 Both were excellent (great crust on the tart) though I would've liked a little more whiskey flavor in the doughnut glaze. The doughnut itself was fantastic. I can't say enough good things about this brunch. Not only was the food great, but service was terrific and I thought the pacing was excellent too. Very, very impressive. I'll now have to give dinner another try. You've gotta love those egg daisies. BR wrote: If you know me, you've probably heard me go on and on about the incredible bread at Cellar Door Provisions. I'm now going to talk plenty about the sourdough bread at Elizabeth - the crust, the crumb, the flavor. This is what you dream about when you seek out sourdough. It hardly needed accompaniments but there were plenty - butter, a foie gras owl and raspberry jam, and prosciutto. As good as the bread was on its own, it was that much better when eaten with the foie gras & raspberry jam. Yes, I've always thought the bread service at dinner was outstanding. They are doing it right. BR wrote: Served at the same time as the bread were butternut squash with hollandaise and a kale salad. Both were excellent, but the kale salad surprised me most simply because I usually dislike all things kale. The kale was cooked until tender but not mushy. There was some Wisconsin parmesan-style cheese and toasted breadcrumbs. There seemed to be something slightly smoky to the dish though I'm not sure what it was. But this is kale I could not stop eating (never thought I'd say that). The butternut squash was not only a pretty dish, but also delicious - the squash and hollandaise made for a perfect pairing. But in general, I would agree that I really enjoyed Elizabeth's brunch service. I don't normally like to go out for brunch, but I could definitely see myself returning here. Very interesting - since I typically avoid cooking with or otherwise eating kale at home, I appreciate your insight. I'm now very curious how they prepare the kale because the texture and flavors of the dish were perfect. Hey BR, glad you came for brunch! Sorry you might have experienced us on an off night. Trying our best to eliminate those. Hope to see you again soon! I would echo the comments above, just having enjoyed brunch today. Menu remains the same and everything was really, really great. Each dish was excellent and provided a really nice variety of sweet/savory/rich/spicy. I also thought it was a great value, considering the amount and quality of the food. Sure, it is a little more than I might normally spend at brunch, but I thought it was worth every penny. They seemed to be doing very brisk business, with every table full when we arrived near the end of service. Service was quick and to the point, but very friendly, with each dish explained upon delivery. Honestly, the only bone I have to pick with the experience was the coffee. It was really, very good coffee. But it was $8 per person (plus tax), which I found to be a really wacky amount of money. Easily the most money I can remember ever paying for drip coffee. Maybe it was the fact this felt like brunch and not a high end dinner, but it made both myself and my GF pause for a second. I still loved the meal and stand by that it is a good value, but I saw a few other tables get their bill and everyone pretty clearly was stunned by the amount coffee cost (or they just had bad eyesight and needed to stare at their bills for an extended period of time). Perhaps it is some extremely rare or desirable coffee - I doubt it, and even if it is, it was never explained that way to us. So, this ended up exactly how I didn't want - half my post is just talking about coffee prices, like some cranky octogenarian. I did really love the meal, as did my GF. Will I go back? Definitely. Will I order coffee? As far as I'm concerned, it isn't brunch without ample amounts of coffee...so yes, yes I will! Anyhow, this nondescript little storefront keeps putting out food that teases and impresses eyes and stomachs. It's really a treat to eat there. If I were more into long fixed price meals (this one was estimated to last 3 hours but ended up taking 4), I'd go regularly. Highly recommended to anyone who hasn't been yet. Anyone who went to Bunny the Micro Bakery (RIP) knows that Chef Regan makes bread as well as anyone in Chicago. How do you make that bread even better? Serve it with outstanding housemade butter and a dip that had the flavors of elotes, but better than any elotes around. I can't begin to tell you what everything was on this plate other than mushrooms and ground cherries. Everything was good, though I thought a touch of heat from somewhere would have made it even better. Regardless, the fried maitake mushrooms were a highlight of the meal for everyone at the table. If you're going to have a meal called Harvest in prime stone fruit season, this is the kind of dish that needs to be served. Peaches with an amazing fennel granita (along with bee pollen and something else I can't remember) was just a great dish that I wish I could try again with fully functioning taste buds. 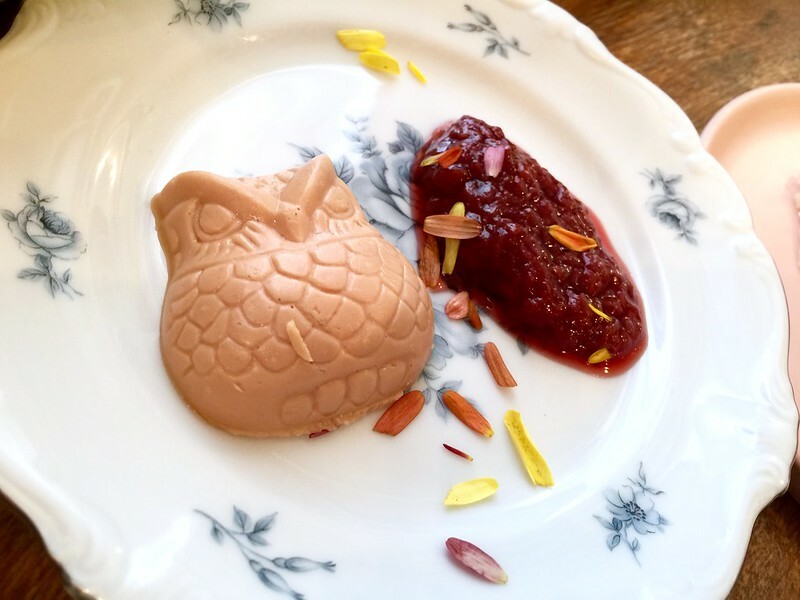 The owl molds, often used at Elizabeth for foie gras torchon, were called into service for mushroom ice cream. Not visible in the picture is the excellent dulce de leche and dehydrated banana underneath the owl. Back to Elizabeth for another stellar meal (this time joined by friends we've kept in touch with since college). The current menu is "Alice in Wonderland" and although the servers didn't tell us how most of the dishes tied to the story, the food was, as always, beautiful and delicious. The restaurant was festooned with playing cards, and the table set with "Drink Me" notes tied to teacups (which were used in the first course). Two service notes: instead of delivering new cutlery for each course, the table has a leather pouch for each couple containing several sets for use in a couple courses. These were refilled a couple times during the night -- which lasted over two and a half hours. This is also the first time we've been there and not presented with a printed menu. The first course is the only one that disappointed -- although anything that is accompanied by their famous Mushroom Tea (the "Drink Me" item) is hard to be a disappointment. The rabbit rillettes (closer to a country pate with its gelatin) were underseasoned (strange considering the number of flavors in many of the other dishes), and the accompanying flower cracker (labeled "Eat Me") a little tough. This was followed by a (kurabata?) oyster with mignonette sauce and a cucumber gelee (in a separate cup) and lots of little dots and garnishes. This is probably the sweetest, most delicate oyster I've ever eaten. Next was a beggars purse filled with kedgeree -- smoked fish and eggs -- a perfect little bite that if served at a cocktail party would have me chasing the servers around the room for more. 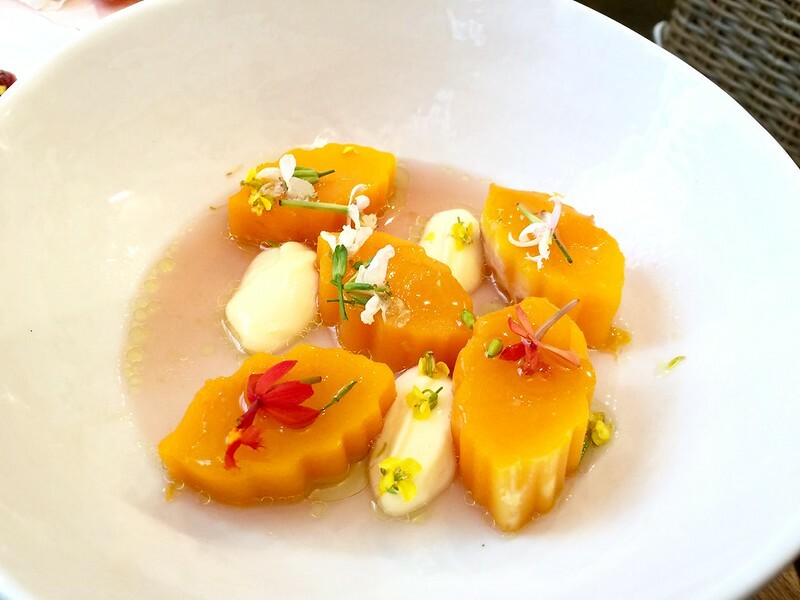 [*] The soup was butternut squash and foie gras, one of the richest things I've ever had. Foie gras molded in the shape of a small button mushroom and beet leaves were presented with the soup poured into the bowl. [*] Bread course included cultured butter, schmalz with herb dust, and a chicken broth with fresh herbs, the bread containing an oat porridge. I'd have loved a little more bread to soak up sauces in the various courses... but I'd have probably eaten it right then. [*] Queen of Hearts course featured smoked beets, thin slices of root veg (some pickled), and various dots of other flavors including tangerine. I have got to try smoking beets, they came out fantastic. The server said they were par-cooked, smoked for an hour, dehydrated, soaked in agrodolce, then sauced and cooked a little more. I think I'll start with just smoking slices with a rub. [*] A thin carrot, rolled in olive tapenade, then dehydrated and cooked, was one of the tastiest things of the night -- that's another flavor combo I want to work with. it was served whole with a dollop of yogurt, we were advised to eat with our hands. [*] A pasta-like course with spaghetti squash and enoki mushrooms had a buttery sauce I can't place... but I want more of it. [*] Mock Turtle Soup was echoed with root vegetables (including foraged wild ginger that unfortunately had almost no ginger flavor) and cubes of venison. A roti was served with this so you could grab pieces of venison and dip into an herb-laden vinegar. [*] Mignardise was two macarons (pistachio/yuzu lemon, white chocolate/(walnut? )), a sugar cookie with raspberry jam, and a chocolate cookie. I don't think I could ever get tired of this restaurant. If I just got some mushroom tea, foie and bread with cultured butter (the upscale version of the Olive Garden lunch? ), I'd be happy, but they keep entertaining and surprising with every meal. Had a wonderful meal at Elizabeth on Wednesday; the menu was the same as the post above and I (or more accurately, my wife) would echo the sentiments of the poster. It was a really lovely meal. I wanted to mention two things; first, the flash sale deals that Elizabeth puts out to the email subscribers are certainly one of the best values in the city of Chicago. I don't mind eating out during the week and these deals have allowed me to eat at Elizabeth much more than any other Michelin rated restaurant in the city. Second, Elizabeth is the most accommodating tasting menu restaurant with regards to dietary restrictions I have found. I am a vegetarian; my wife is not. They have always been very accommodating and do a great job of adapting the dishes to be vegetarian. 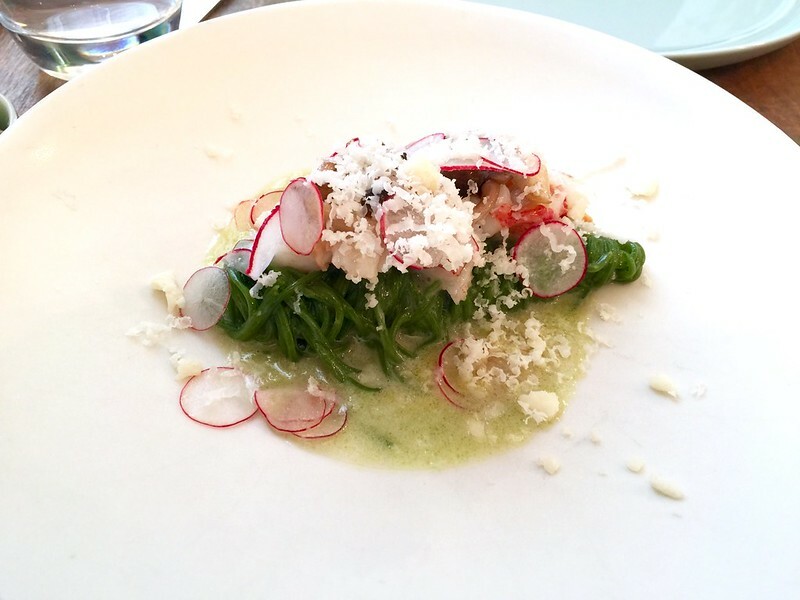 It is sometimes hard to access tasting menus as a vegetarian so I wanted to give Elizabeth a shout out for this. We had scallop crudo rather than cuttlefish. The desserts were picture perfect, including the rather on-the-nose peanut butter ice cream in marrow bone for Isle of Dogs, on which this is incidentally a great read. We went a la carte with beverages which I like doing when a beer and cocktail list is this fun, and enjoyed some Hitachino Nest rarities and rich tinctures served in tonic bottles, to maximize the "annoying hipter's ironic distance" (less of a great read). Service was stellar start to finish booking through Tock a breeze. Wow, that plate is the best! 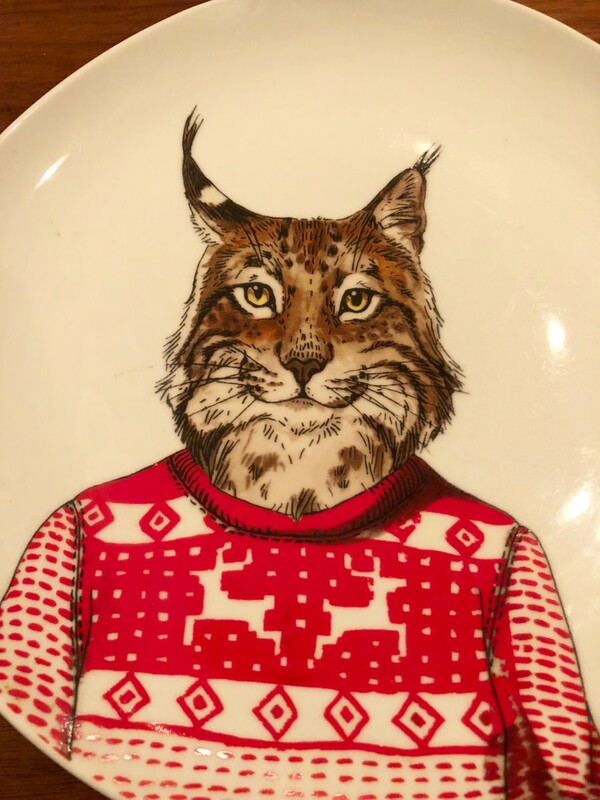 I actually bought some of those animal plates after I first saw them Elizabeth, but that one wasn't an option at the time. And it looks like they're no longer offered at West Elm any more. Oh well! Tambreet wrote: Wow, that plate is the best! I actually bought some of those animal plates after I first saw them Elizabeth, but that one wasn't an option at the time. And it looks like they're no longer offered at West Elm any more. Oh well! The internet says in stock AND marked down. Just booked my second trip to Elizabeth and am enjoying reminiscing about their Americana menu from the end of '18. I was blown away. I think it started out a little slow, and the first couple bites were a combination of pretty forgettable and very small (the kind of thing people complain about tasting menus--how can I get full eating thirteen bites of basically nothing), but once it started hitting it basically did not stop. The theme led to a couple less than stellar presentation on the dishes (a beautiful piece of tuna completely hidden under a noodle and called the unappetizing "tuna casserole"; their wonderful bread course accompanied with "spam"), but those are minor complaints when faced with how great the food tasted. Highlight for me was pretty easily the deconstructed beef tongue reuben. I think easily my favorite bite of 2018. Had some melted cheese and charred greens, a rye cracker and (maybe?) a little slice of apple. So happy to think back about that. The table side caesar with a caviar-topped crouton was also a joy to eat. To top it all off, service was warm and knowledgeable from start to finish. This is a gem of a restaurant and I am so looking forward to my return. A shout-out for the Wicked and Wild School of Wizardly Wonder menu: it embraces the Year 6 and 7 epic darkness with the Year 1 enthusiasm. My favorite moment was the disclaimer before the expecto patronum venison course that "some of the kids" that have been coming in for the menu can't bring themselves to eat Harry's spirit guide. Indeed, there were more very young people in the full room than any other tasting menu I've seen. They were having a blast, and if this is the way to build the pipeline of diners, I'm all for it. This main event deer loin was served seared and rare with minced meat pasties and a bone broth with acorn tortellini, offering the perfect opportunity to build bites of whatever your textural and game preference. My favorite course though was the chocolate frog with a side of every-flavor beans: massive nuggets of Alaskan king crab leg nestled in a pond of 40-ingredient chocolate mole, with a fragrant side of "baked" barbecue beans with notes ranging from fish sauce and caramel to fruit. Favoring the book edibles over the movie, the menu also highlighted Nearly Headless Nick's moldering feast with multiple plates with a wilting fungi focus. On the experimental side of things was a vampire lollipop of puffed amaranth rolled in blood powder, with a sticky granola bar texture you're just not likely to find at any other Michelin star. They really went for deep dungeon cellar pairings - vintage Spanish and Mexican rarities on the lees with (in succession) huge flavors, mezcal-like smokiness, estimable funk, briny ocean nose, and eventually mineral and herbal aromas in the dessert vermouth. We thought these all hit perfectly with their courses. The restraint on sweet flavors throughout the meal, including the light and vegetal beet birthday cake, was well-advised and important in the sustained enjoyment of the many courses. The servers are the epitome of casual charm. The virgin Polyjuice Potion was also hilariously great. I think we're still who we were when we entered but can't be sure.